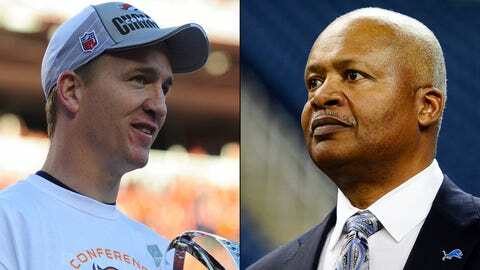 Denver Broncos quarterback Peyton Manning says he's a big fan of new Lions coach Jim Caldwell. Denver Broncos quarterback Peyton Manning confirmed Tuesday during the Super Bowl Media Day in New Jersey that he called the Detroit Lions during their coaching search to endorse Jim Caldwell. Caldwell, who was named the Lions’ new coach two weeks ago, became his quarterbacks coach with the Indianapolis Colts in 2002, Manning’s fifth year in the NFL. Caldwell went on to be the Colts’ head coach from 2009-11, the last being the year that Manning missed because of neck surgery before signing with the Broncos. "Jim Caldwell has meant a great deal to me in my career," Manning said during the news conference to set up Sunday’s championship game against the Seattle Seahawks. "I felt like once he got to Indianapolis and became my quarterbacks coach that my game really improved. I felt like it took a step up and I thought Jim had a great deal to do with that. "He and I had a set routine that we tried to perform every day in the meeting room, on the practice field, with different drills. I just felt from 2003 really until 2008 when he was the quarterbacks coach, I was playing at a high level. "I was glad to call the Lions on his behalf and share my thoughts of what he might be able to do to help their organization. I was really happy for him that he got that job." Jim Caldwell has meant a great deal to me in my career. One of the reasons Caldwell was targeted by the Lions was because of his background working with a quarterback like Manning. The Lions are hoping Caldwell and offensive coordinator Joe Lombardi, Drew Brees’ former quarterbacks coach in New Orleans, will have an impact on Detroit’s franchise QB Matthew Stafford, who is coming off a poor second half of the season.